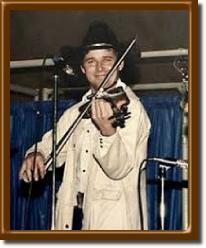 Terry Morris (1956 - 1988) is known for popularizing and taking the best of the Texas contest fiddle style to the entire country, and he is a ‘fiddle player’s fiddler’, revered by all. Terry Joe Morris was born in Ft. Worth, Texas on March 6, 1956, the youngest son in the family of six children. Terry grew up near Decatur, Texas in a very musical family. He began singing at age 2 and took up the fiddle shortly after. He played often with brothers Dale and Kenneth. Morris was greatly inspired by champion fiddler Benny Thomasson at a jam session, and then spent his entire time traveling around the state, staying with his many fiddle friends and absorbing everything possible that would contribute to an improved style of Texas fiddling, with master fiddlers as his teachers. Terry went on to win innumerable contests wherever he went. His most respected wins as a champion fiddler include the Texas State Champion Fiddlers' Frolics in Hallettsville, Texas, Texas Old Time Fiddlers Association Winner, 5 years Crockett World Champion Fiddler, 3 successive years Grand Masters Champion in Nashville. Tennessee. Terry performed in Ft. Worth several times at the historic Panther Hall Ballroom, and on his 18th birthday the family gathered to hear him on the Grand Ole Opry playing fiddle for Jean Shepard. Roy Acuff introduced Terry and wished him a happy birthday. The entire family felt very honored. Terry’s legacy as a supreme contest player lives on in every fiddle contest in the country. His driving and creative breakdowns, smooth waltzes, and rhythmic swing tunes are copied and emulated by many. Terry Morris was inducted as a 2016 member of the National Fiddler Hall of Fame.